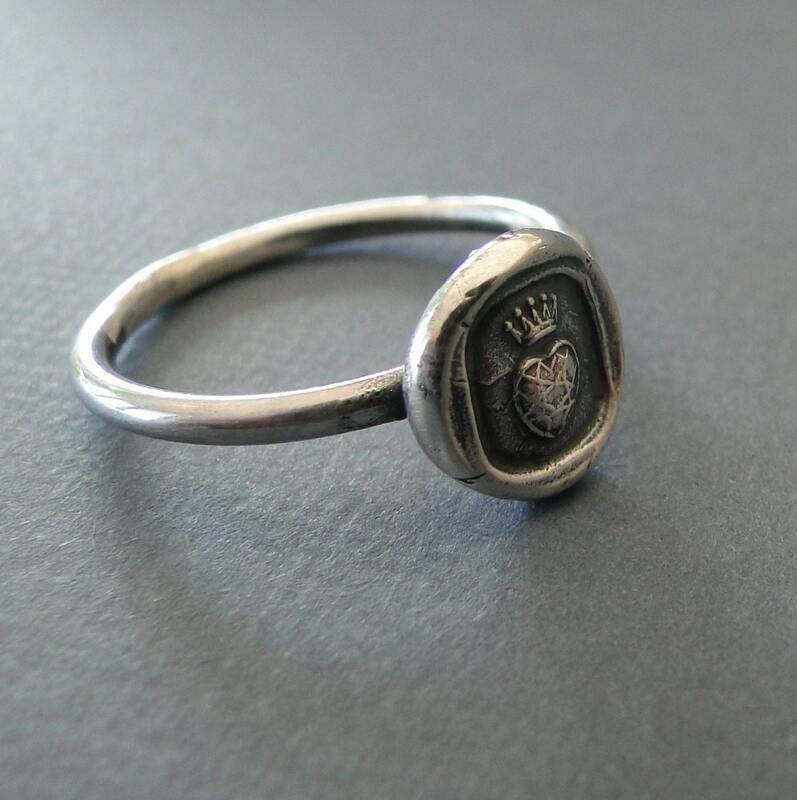 This small antique wax seal impression features the image of a heart with a crown above it. The crown is the symbol of the highest achievement, the heart represents love, loyalty and kindness....... Therefore a crown above a heart represents the highest and purest love. The table of this ring measures approx. 11.3mm across the centre. This may vary however due to the fact that each piece is individually handmade. 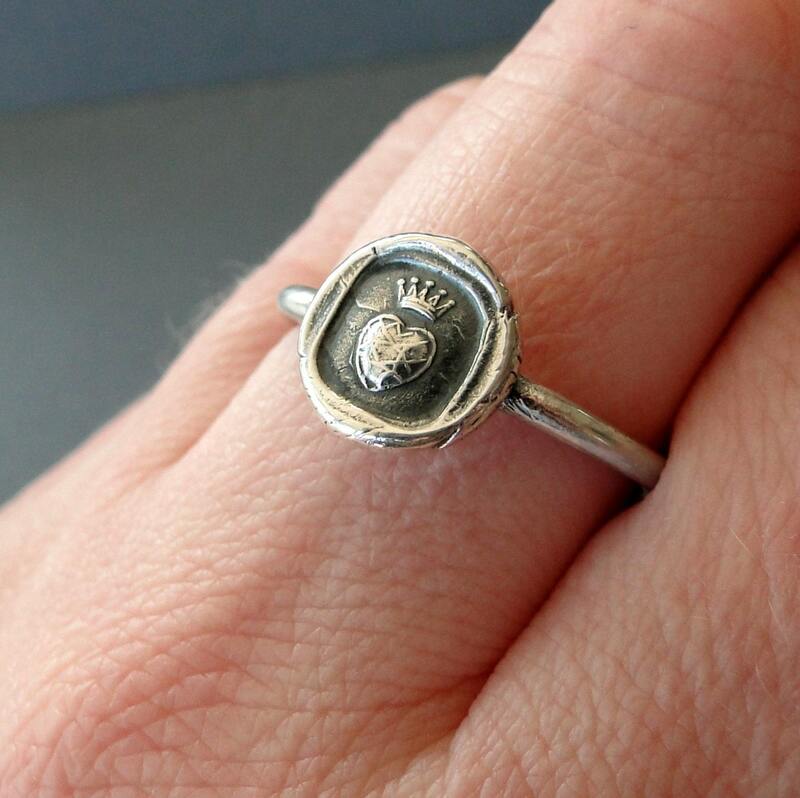 Please choose from the drop down menu what size ring you would like. If the size you require is not there please contact me and I will be happy to make any size needed. This will be ready to ship within 3 days...... usually much sooner though! ☆ Every piece made by SWALK jewellery is made individually by hand. It is not cast or shuttled off a machine or 'assembled'. ☆ Every link is securely soldered for security and safety so you don't loose your piece. ☆ Customer service is highly prioritised here at SWALK.... so if anything goes wrong, your piece isn't as you imagined, or for any reason you want to return it.. that's 'A OKAY' with me! 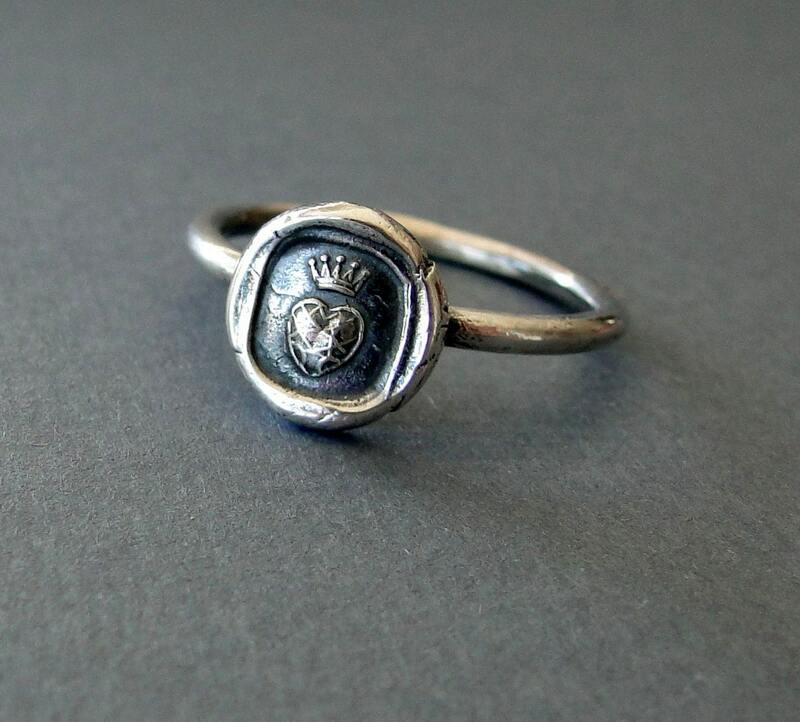 Each piece offered for sale is an imprint or cast of an antique wax seal from my personal collection. I use 100% sterling silver as this has the strength and durability needed for a piece of jewelry that is to be worn for years. All the jumps rings, clasps etc, are also sterling silver and each part is soldered, also for strength and durability. My intention is to make a piece that could become an heirloom too and for it to last generations. Each piece is individually handmade and therefore no two pieces will be exactly the same, they will however be extremely similar. The mark of the maker has been purposely left on the casts. The signs of age, cracks and tool marks all add to the charm of the piece and are an intentional feature. 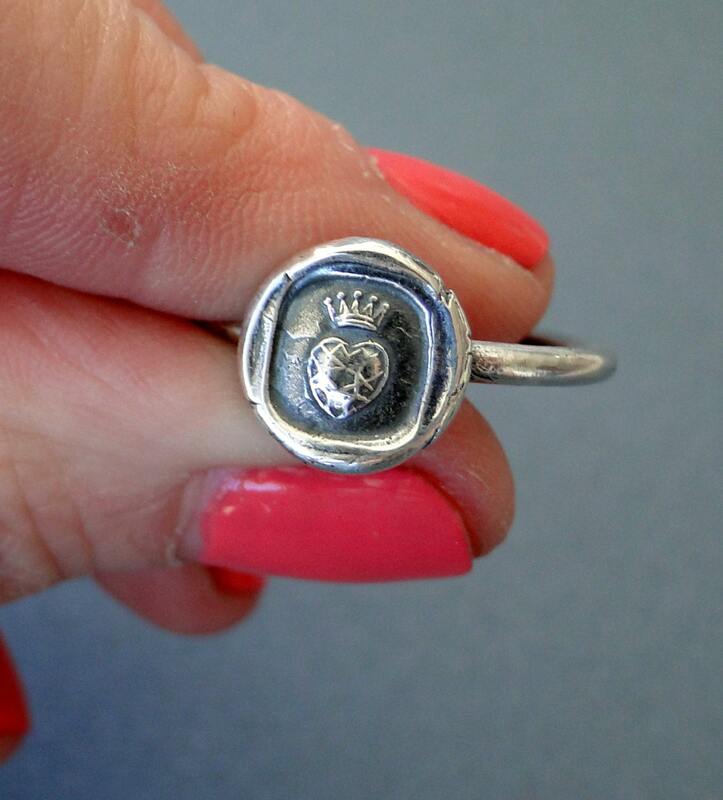 I am happy to make any of my seals into rings, bracelets, earrings etc. even if they are not listed in the shop. Please contact me for suitability and so that we can discuss your ideas. Please read the listings carefully for the size of the piece you are interested in. Sometimes photos can be deceiving and you might be surprised or unhappy by the size of your amulet. All ring sizes and bracelet sizes are catered for. If your size is not included in the listing please contact me and I will be happy to remedy it. All SWALK amulets are made of sterling silver. This has a copper content of .075 and a silver content of .925 . It therefore can be subject to tarnish like every other sterling object. Please do not dip your piece into 'silver dip' as this will remove the 'patina' on the piece. Do not wear your SWALK item in chlorinated water. Be careful with creams, cosmetics and perfumes as these may discolour your piece. If your amulet becomes discoloured you can polish it with a silver cloth and then wash it with a gentle soap. Each SWALK seal comes with its own explanation card. It will arrive wrapped in tissue in a linen drawstring SWALK bag. I am delighted to offer Wholesale. And offer competitive wholesale discounts. SWALK reserves the right to be the only seller of our amulets online. I do not offer this service at the moment. 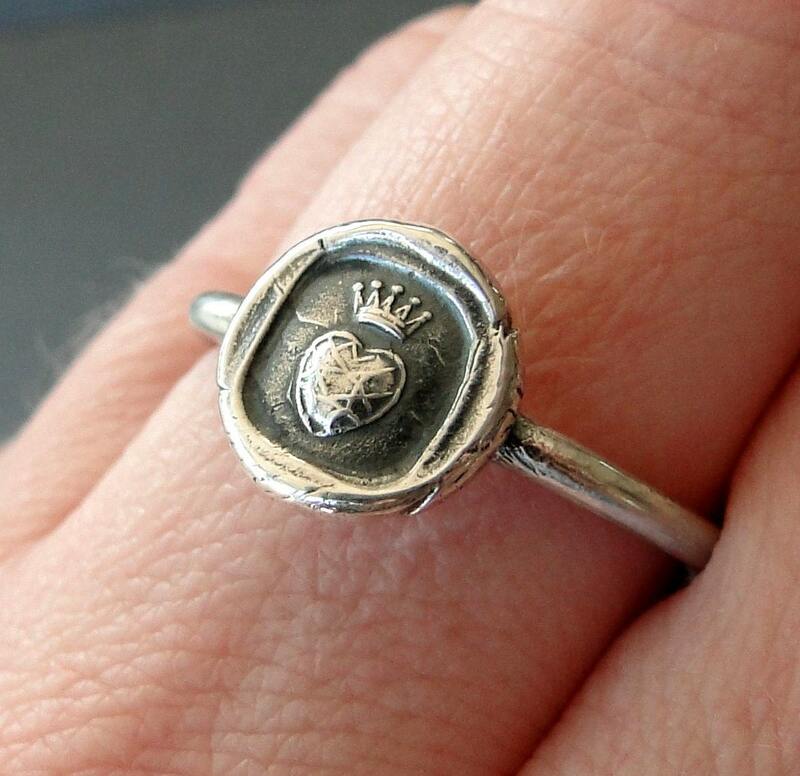 You can of course get your own jeweller to engrave the back of the seal, but any items that have been customised or altered cannot be returned. Can I get the seal made bigger? The seals I use to impress the images are antique and are usually at least a hundred years old. I feel incredibly lucky everytime I 'find' a new seal. The image that the seal impresses is the only size it comes in. The sizes will always be mentioned in the listing. I CAN however make a larger 'border' of silver around the image to make the amulet bulkier. Please contact me for pricing if this is something you are interested in. My parcels are shipped by An Post. An Post is Irelands national postal service. They have a superb reputation internationally and are quick efficient and professional. Unless your parcel is caught in customs in your country (which is completely out of my control) it usually takes approx. 5-8 working days to arrive most places on the earth!